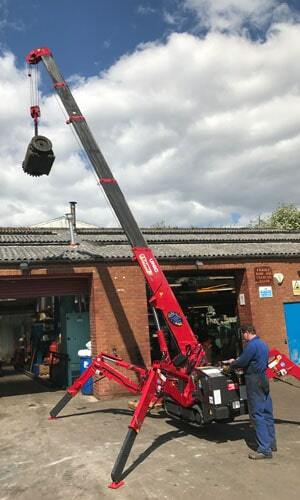 Our spider crane is an effective, flexible, helping hand in hard to access areas, with a total 2.9 ton lift. It is capable of fitting through a normal doorway, used in places where there is no overhead crane or areas that other heavy, large cranes cannot get close enough to. As Built up environments across the world continue to grow and inflate, so do the high demands on engineering works to find ways of working efficiently in areas where space is at a premium. Mini-cranes like spider cranes offer versatility, manoeuvrability and lifting capacity therefore, fast becoming a natural solution to increasingly complex challenges which DP Gears are happy to help with. Spider cranes are loved across the world as they are an ingenious way to heavy lift in areas too small too gain access with a larger crane. The reduced weight and compact design of UNIC spider cranes means they are ideal for being moved and used on low-bearing floors. The smallest spider cranes are so narrow they can be moved through standard single doorways. At DP Gears our Spider Crane is available for onsite work – inside or out. From water treatment plants to aggregate industry to car and food.